What are alternative fuels and what are the benefits? Alternatives to gasoline and diesel include Compressed Natural Gas (CNG), Liquefied Natural Gas (LNG), Ethanol (E85), Methanol, Hydrogen, Battery-Electric power, Biodiesel, and Liquefied Petroleum Gas (LPG or Propane). In addition to reducing our nation’s dependence on imported petroleum and improving energy security, alternative fuels are less polluting. Other technologies such as Hybrid Electric (HEV) and Plug-in Hybrid Electric (PHEV) vehicles are encouraged but not recognized as alternative fuels. How does Clean Cities work? Clean Cities mobilizes local stakeholders in government and industry. In approximately 100 coalitions nationwide, Clean Cities draws local stakeholders from the public and private sectors. Clean Cities coalitions provide a forum for members to leverage their resources, develop joint projects, collaborate on public policy issues, and promote Alternative Fueled Vehicles (AFV’s) in their communities. What is the focus of Sacramento Clean Cities? The Sacramento Clean Cities Coalition works with stakeholders and local fleets to help implement AFV’s. This includes information on vehicles, funding, economics, technical aspects, training, fueling and safety. 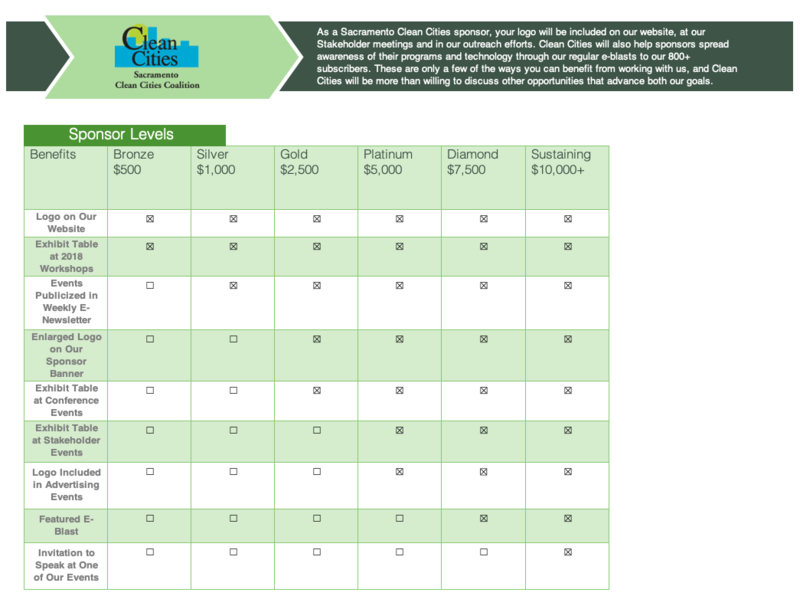 Sacramento Clean Cities is a non-profit 501c3 organization. Why should I become a member in the Sacramento Clean Cities Coalition? Members have additional funding opportunities, access to valuable information and resources and opportunities for national public exposure. Sacramento Clean Cities also provides opportunities for networking and partnerships, two keys to successful AFV programs. Additionally, Sacramento Clean Cities offers industry vendors opportunities to meet and talk to purchasers of AFV products and services. What are the goals of Clean Cities? To reduce our nation’s dependence on imported petroleum and help clean up the air. The program emphasizes applications in “niche markets.” Examples include refuse and recycling trucks, freight and package delivery trucks, transit and school buses, airport taxis and shuttle buses. Subscribe to our mailing list here. You can also browse through our website here or contact Sacramento Clean Cities President Keith Leech or Vice President Tim Taylor.